Plan of Paris illustrating the early development of the Paris Metro. 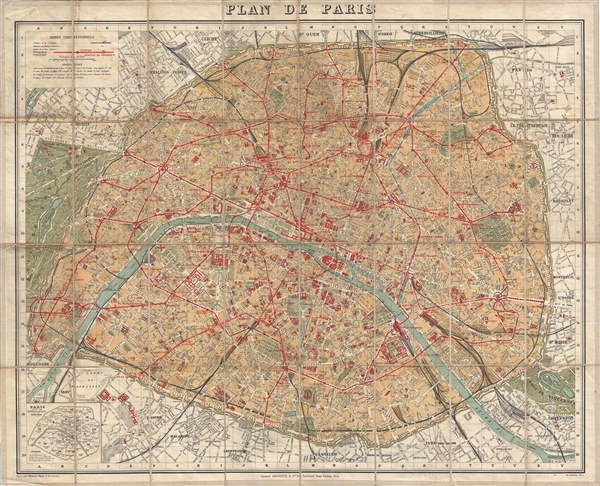 An attractive map of Paris, France issued around 1910 by Hachette and Company. The map covers the old walled city of Paris from the Bois de Boulogne in the west to the Bois de Vincennes in the east. All streets are labeled as are various gardens, rail lines, parks, and important buildings including the Louvre, the Eiffel Tower, the Invalids, Notre Dame, and countless others. Hachette was issuing this map in preliminary states from as early as 1894. While the current example is undated, the presences of the walls and the development of the Metro, and help us to narrow a date to the early years of the 20th century. Good. Minor soiling. Dissected and mounted on linen in 28 panels. Original linen.